Is Cotton an Annual or Perennial Plant? How Long Does Cotton Seed Keep? Watching bean seeds grow into to a bean plant is a common science project for young children. Bean seeds that are placed in a jar with moist cotton germinate rapidly. The cotton retains the moisture for the seeds and provides just enough for them to germinate. It also keeps the seeds from getting too moist and rotting. Once germinated, the seedlings can be dissected if it's a science experiment, or they can be transplanted right into your garden. Moisten enough cotton balls to cover the bottom of a cup or plastic bag. The cotton should be damp but not dripping. Place the cotton balls at the bottom of the cup or plastic bag. Place the number of bean seeds you want to germinate on top of the cotton. Close the plastic bag or cover the cup with plastic wrap. Place the bags or cups in a sunny window and watch for germination. Transplant the germinated bean plants into your garden if you want to grow them to mature size. 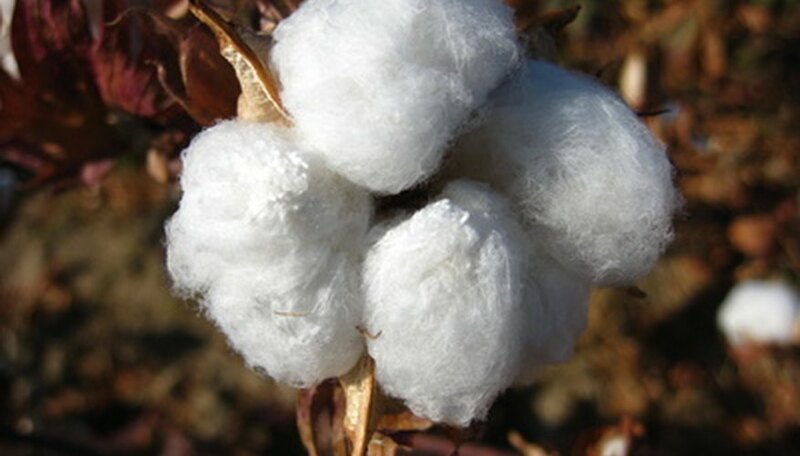 Cotton (Gossypium species) is a perennial plant often cultivated as an annual for cotton-producing industries. Cotton plants become tall shrubs if allowed to grow freely. In the cotton industry, plant growth regulators are often used to manage cotton development. Hand pick the cotton from the bolls. Grab the cotton ball at its base and twist it out of the boll. Drop the cotton balls into a bag as you go. Leave any immature cotton behind for another day. Spread the cotton balls out in a cool, dark place with ample air circulation to allow them to dry out completely. Separate the tiny black cotton seeds by hand after they have dried. Keep a bowl handy to hold the cotton seeds. According to the Agronomy Journal, cotton seed has been kept and germinated after as long as 45 years. Many influences affect the viability of cottonseed, including temperature and moisture levels. Decide between freshly harvested cotton flowers or dried cotton flowers. Dried cotton flowers are available all year. Newly harvested cotton flowers are available from late summer through fall. Call a cotton farm or visit its gift shop to buy cotton flowers, fresh or dried. Cotton farms are located mainly across the southern portion of the United States, such as Mississippi, Texas, Virginia and Arizona. Purchase cotton flowers at a local florist. She may have to make a special order to get you what you need, so inquire several weeks in advance. Buy dried cotton flowers at a craft store. Call first before visiting since it might not be available or in stock. Look online to purchase cotton flowers. Dried flowers will be easier to find, but a few dealers sell fresh cotton flowers and even cotton plants, if desired.